Pori Urundai is a very neglected snack recipe enough though it is very easy, sweet, tasty and healthy. I think Pori Urundai was associated with Karthigai deepam which comes immediately after diwali because Pori Urundai is light sweet and it is not good to have heavy sweet just some time after the diwali festival when we have already had enough heavy sweets. 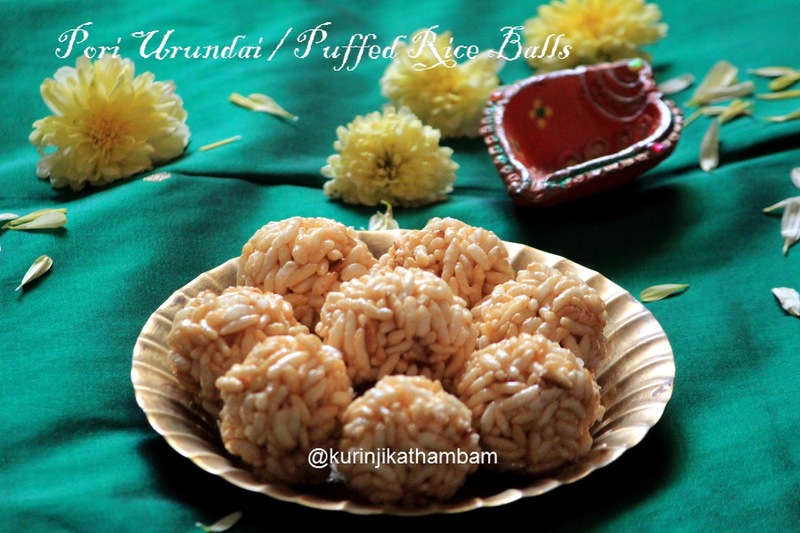 Make Pori Urundai as often and especially as a sweet balance when you preparing some spicy puffed rice. 1. In a heavy bottom pan, add jaggery, crushed cardamom pods and water. Cook them in a medium flame. 2. Mix them well with ladle. 3. Wait until the jaggery melts completely. Then strain the jaggery syrup with steel strainer. 4. Pour this strained syrup in the same pan and cook it in a medium flame. 5. After few mins the color of the syrup will change. At this stage you can check the syrup consistency. 6. Take water in a small bowl, pour few drops of the syrup and able to make ball from the syrup is the correct consistency. 7. If you cannot make ball, cook until you reach this consistency level. 8. After you reach this level, switch off the flame. 9. Add puffed rice with this syrup and mix them gently and carefully. 10. Then grease your hands with oil and immediately make lemon size balls from the pori mixture. 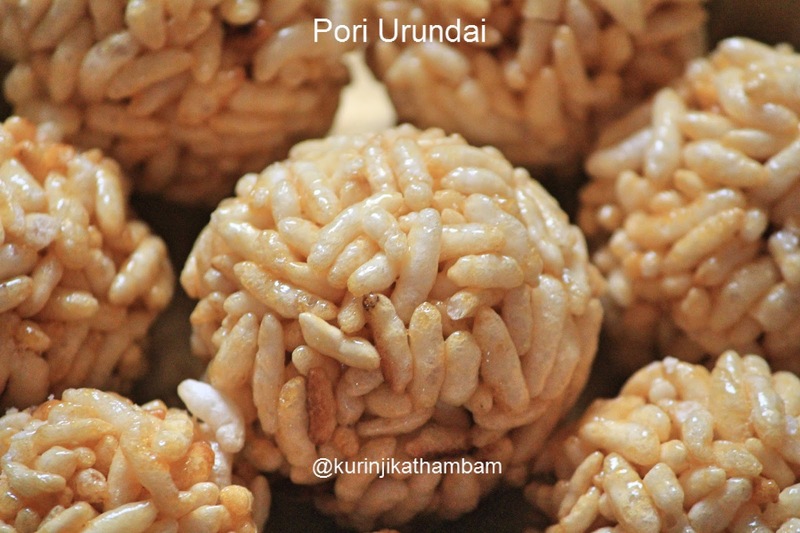 Tasty and healthy pori urundai is ready to serve. 1. If You switch off the flame before the sugar syrup reaching the correct ball like consistency level, you cannot make puffed balls. 2. After mixing the pori with jaggery, immediately make all the pori mixture into rough balls which can later shaped properly. Don’t delay by shaping all the balls in the first attempt because if the pori mixture looses heat, it will be difficult to shape into balls.